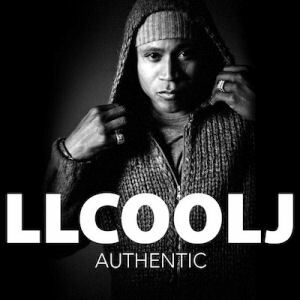 RapReviews.com Feature for May 14, 2013 - LL Cool J's "Authentic"
"When you say that I'm the best, remember I said it first!" The swagger James Todd Smith has on "Authentic" is the same he's had since the 1980's, when neither LL Cool J nor hip-hop could live without his "Radio." If the original Yankee Stadium was "The House That Ruth Built," then Def Jam Recordings is and always will be "The House That LL Built" given he made the first full length album the label released. In the years and albums that followed his combination of pugilistic swagger and female friendly ballads made him accessible to a large demographic, one that only grew larger through movie and TV appearances. His transition from hip-hop to household superstar was mirrored and emulated in the decades that followed. Thanks to Fresh Prince and LL, you can now see Nicki Minaj hosting American Idol. The road to rap stars becoming TV stars all starts with them. "Don't forget where you come from! Don't forget about me." It would be hard to overstate LL's importance to the generations that followed him, nor how many people emulated (or being less kind directly ripped off) his style over the years. It would be much easier to simply say the dues LL paid opened a whole lot of doors that it would have taken much longer to kick down. As such we could have all bid his rap career a fond and respectful farewell on "Exit 13," and let James do what peers like Dana Owens (Queen Latifah) and Dante Terrell Smith (Mos Def) did - become as well if not better known for their acting. By all accounts LL's role as Sam Hanna on the popular CBS drama "NCIS: Los Angeles" and the show itself are a big success. There's every chance future generations will know him not as the rap star who crossed over to acting, but as the actor who got his start in the entertainment world as an emcee. "Knock knock, who's there? The one, remember me? I'm looking kind of different these days - don't you agree?" As I've already connected the two of them together by their historical importance as crossover rap stars, it only serves to further the aim of this review to mention something ELSE that both Will Smith and James Todd Smith have in common - besides a last name that is. Both of them have had to scratch that itch to come back just one more time, to do one more album, to take up that old battle cry of "can't leave rap alone - the game needs me" and proclaim themselves as relevant hip-hop artists even when it's acting that now butters their bread. Perhaps once an emcee, always an emcee. Maybe it's both a gift and a curse. Is it fair to say Sam Hanna is a better choice? I suppose that depends on how you feel about him doing duets with Brad Paisley. "Authentic" has the most diverse list of guest stars of any album LL has ever done - Eddie Van Halen to Charlie Wilson, Seal to Snoop Dogg, Bootsy Collins to Travis Barker. There are two equally valid interpretations to this situation. (1.) As an authentic hip-hop legend, LL has the right to collaborate with whoever he wants and once again push the boundaries he so successfully broke through decades ago. (2.) As someone who hasn't recorded a rap album in five years that is no longer rolling with the label and empire he helped build from scratch, LL is artistically adrift and throwing things at the wall at random to see what sticks. The truth is "Authentic" is a little bit of both. LL has bounced back from seemingly insurmountable odds as a rapper before, as any of us who lived through "14 Shots to the Dome" can attest. Even a five year layoff and a successful acting career can't hold LL down. At times he even successfully transports himself back in time 10-20 years, thanks to producers like DJ Premier on the song "Jump On It" (unfortunately for some buyers this track is a Target only exclusive). The heavy chords and fat scratches clearly bring out the best of Mr. Smith's hip-hop machismo. Them boys is backwash, you want whiskey!" These highs are met with unfortuante lows like "Between the Sheetz" featuring Mickey Shiloh. The fact the song is technically sound in production and execution thanks to SoundZ and Tricky Stewart has no bearing on the fact the song is an awkward attempt to create the kind of sexual magnetism he had on 1980's songs like "I Need Love," and his breathy whispering delivery of sentiments like "I love you too baby - I really do" feel forced. Some of LL's collaborations are inspired - "Not Leaving You Tonight" featuring Fitz & The Tantrums plus Eddie Van Halen could and should be released as a single; "Give Me Love" featuring Seal is a better ode to passion than his duet with Shiloh - perhaps with such a talented crooner on board he tried harder to not be cornball. Both songs are ably produced by Jaylien. "Closer" featuring Monica feels like he should be cameoing on her song though, not the other way around, and LL has something unfortunate in common with Babyface on "Waiting For You" - going too many years between albums. For anybody who is a fan of James Todd Smith as a rapper from day one, first of all congratulations, you're probably as old as I am now - many of our peers in or outside the music business didn't make it this far. Second of all you won't hate "Authentic," because no matter what else he is, LL Cool J definitely is that and owns that like few other people in this industry can or ever will. There's enough flashes of LL in his prime to carry you through, and songs like "We Came to Party" with Fatman Scoop and Snoop Dogg are unapologetic throwbacks to the days when he and Rick Rubin ruled the world. Perhaps an entire album like that would have been even better - at least it would have has a consistent theme. Despite his years away acting, LL hasn't really lost his touch rapping. What he has lost is a sense of focus and direction. On "Exit 13" he seemed to be going out on a high note, saying "Thank you and good night" to his adoring fans, and moving on with his successful acting career. Now that he's back, the only thing you can say is that it's nice to hear him rapping again - yet if he wants to be sharp and on point one album every five years just won't cut it.